This is an in-person, mandatory training. ACA Care Managers, Supervisors, and Directors are required to attend each of the six training modules. You can sign up for a session in Relias. Looking to make an impact in the lives of people with I/DD? Know anyone who wants to get involved? We are hiring! Join us for a Long Island hiring event on Thursday, March 21 from 3pm to 7pm at 1122 Franklin Ave 4th Floor Suite 404, Garden City, NY 11530. Long Island Care Manager and Care Manager Supervisor positions are available from Montauk to Western Nassau County. Please bring your resume for on-the-spot interviews. Learn more and apply at www.advancecarealliance.org/careers. 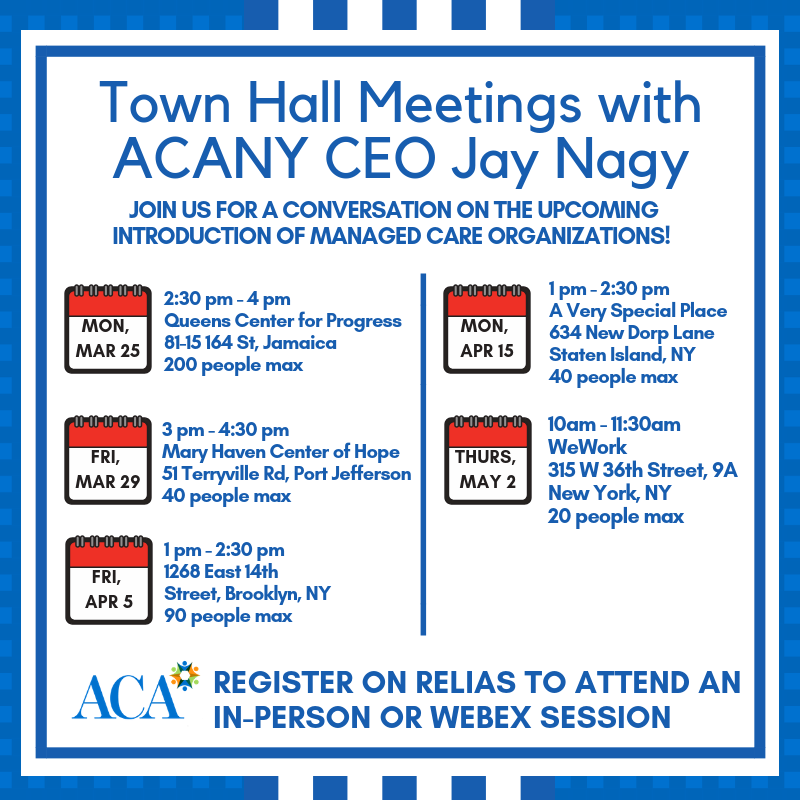 If you have any questions, contact us at careers@myacany.org. These WebEx sessions are NOT mandatory and will be uploaded to Relias for Care Managers to view at a later time. Please join the meeting 15 minutes before the start time to allow some time to trouble shoot if you experience any issues logging in. All provider staff that are responsible for Staff Action Plan development and habilitation service delivery should attend one of these sessions. Both sessions will provide the same information so attendees should plan to attend only one session. Registration in the OPWDD Statewide Learning Management System (SLMS) is currently open. You can enroll by searching The Staff Action Plan and Delivery of Habilitation Services. For assistance with SLMS, please email TalentDevelopment@opwdd.ny.gov or call 518-473-1190.